Greetings, all! After an impromptu hiatus from the blog last week, I'm excited to be back. No real reason for skipping the week other than I was in a bit of a creative rut. Does that ever happen to you? Sometimes you just need to step away and get a fresh start. Let's hop to it! 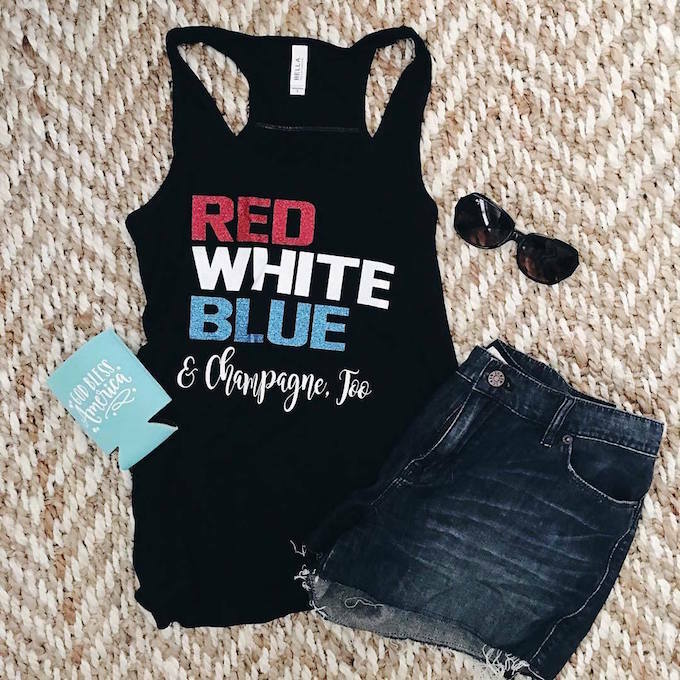 I'm digging tanks by KTees right now, especially this Red, White, Blue, & Champagne, too one for the 4th. On snapchat last week, I posted a story about my hunt for the perfect beach bag. Have you seen this site? You can design everything yourself from the type of leather to the personalization! I just started reading Savannah Blues by Mary Kay Andrews. It's the quintessential summer beach read. Perfect for not having to think too hard after work. As you know, I am a podcast junky. My current favorite? Deep South Details! These two women seriously give me a case of the giggles. You'll love their endearing conversations, fantastic music choices, and entertaining interviews. Tupelo Honey Cafe is well-known as being an Asheville Staple, but they're opening their Atlanta doors two weeks from today. I am already salivating over the menu. Hunter and I did a tasting and tour at Atlanta's first distillery, Old Fourth Ward Distillery over Memorial Day weekend and had so much fun. The space is incredible and the booze divine. Tours take place Thursday-Saturday and come with a bottle of gin or vodka!